10:00 a.m. - 5:00 p.m. To make a tour or tasting reservation, visit http://www.chimneyrock.com/reservations. Located on the fabled Silverado Trail in the world-renowned Stags Leap District of California's Napa Valley, our beautiful Cape Dutch-inspired estate winery is recognized as one of the world's premier fine wine producers. Chimney Rock's Tasting Room is plesant and inviting, staffed with friendly, engaging wine enthusiasts. A wood-burning fireplace is lit in the winter months. Outdoor tasting on our pretty courtyard is offered during the spring and summer months. 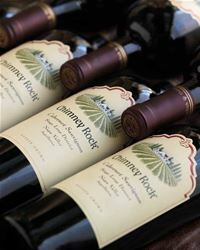 To join the wine club, visit www.ChimneyRock.com or call 707-257-2641. * Complimentary tastings (up to 4 people per visit) when member is in attendance. Napa County residents receive 2 for 1 tastings, Monday through Thursday. Please note we are by appointment. Our reservation line is (707) 257-2641. Thank you! Chimney Rock Winery is certified under the Napa Green Winery Program by the Napa County Department of Environmental Management (DEM) and the Association of Bay Area Government’s (ABAG) Green Business Program and completed all the regulatory components needed for environmental sustainability. These components included developing water and energy conservation methods, preventing pollution, and reducing solid waste. In addition to developing sustainable winery practices, this program is set to become the standard for the state of California. Chimney Rock Winery is certified under the Napa Green Certified Land Program. Chimney Rock Winery has created and implemented a customized farm plan with measured results that addressed all aspects of its property, vineyard land as well as non-farmed land, including practicing soil conservation, water conservation, stable drainage, riparian corridor enhancement, fisheries and wildlife habitat enhancement and long-term improvement and sustainability.